t’s 12:15pm on Thursday. A line rapidly builds outside the dining hall entrance, as students rushing back from their noon classes impatiently wait for their ID cards to be swiped. Inside the servery, the lighting is fluorescent. It smells of savory food blended with disinfectant solution. At the entrée line, an assembly-line of arms and tongs methodically scoop and dollop the main choices — today it’s red-spiced chicken breast, some mystery meat in macaroni, and tortilla veggie pie. A lanky junior wearing flannel and a baseball cap holds up the rhythm of the line as he clears away the last five chicken breasts onto his plate. A few students grimace at the entrée selection and promptly move toward the grill. With a white twill hat perched on his head, the grill chef stands behind a gridiron that’s half the width, but just as long as a pool table. One hand methodically flips hot dogs, hamburgers, turkey burgers, and chicken breasts on the grill, while his other hand scrambles eggs. He has to work fast. Orders are piling up — a student just asked for four hamburgers with over-easy eggs inside each one. Hundreds of bodies dot the long tables in the dining hall. Students with puffy jackets and fat backpacks squeeze between narrow gaps, scouring for empty seats. The clatter of plates and voices of conversation, frustration, and excitement reverberate from wall to wall. Despite the chaos, at least a quarter of the students are deep in concentration, eyes glued to their computer screens, textbooks, or papers. The students are either grappling with class assignments or deep in conversations that occupy 90–99 percent of their consciousness. Food is in their peripheral focus. 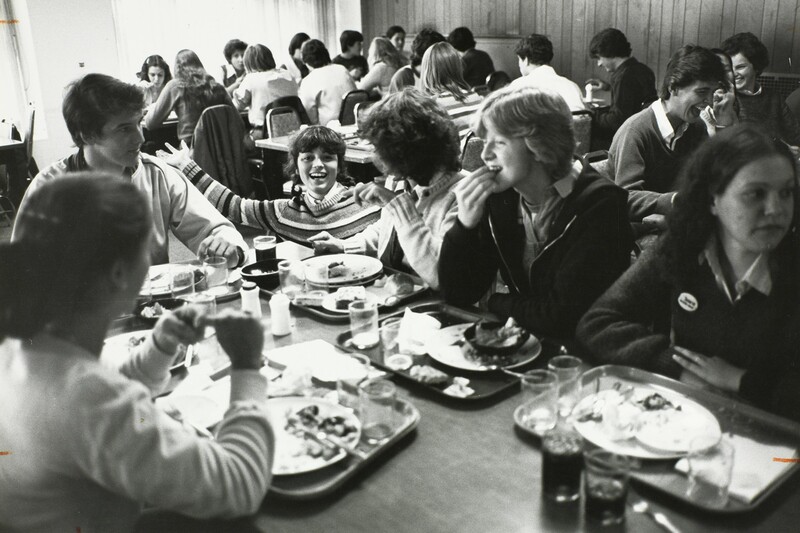 Observe Specimen A: the male student sitting in the back of the dining hall, with dark bags under his eyes, uncombed hair and a hoodie, and six buffalo-style chicken breasts on his plate. He shoves forkfuls of poultry into his mouth while simultaneously scribbling math formulas in his notebook. A bit of red juice drips from his mouth and onto the paper, staining his equation. He doesn’t wipe it away. He doesn’t glance away from his work even once before the six chicken breasts are transferred from the plate and into his stomach. Everyone, including Specimen A, knows what a chicken breast is. To Specimen A and most people, the chicken breast means nothing more than sustenance and a familiar taste. Beneath the surface, though, there’s much more to learn than most people care to know. At the simplest level, a chicken breast is the pectoral muscle from the animal, and is one of the most popular cuts of poultry. With lower fat content than red meat, a 100-gram serving of baked chicken breast contains 4 grams of fat and 31 grams of protein.¹ Rather tasteless with uniform texture, it acts like a blank canvas for chefs to play with. Chicken is the most popular meat consumed by Americans today, although this wasn’t always the case. Chickens played a minor role in the American diet until the 21st century poultry industry increased the supply of chickens and reduced the cost of raising them, by infusing chickens with antibiotics, raising them indoors, and packing them together as tightly as possible.² In any case, these are probably not the thoughts racing through your mind moments before you ingest your chicken parmesan or herb roasted chicken (or maybe they are, because you watched Food Inc., and are now highly educated about the industrial food system). Before we go any further, let’s acknowledge some of the general well-documented effects of large-scale livestock agriculture. The concentration of manure in feedlots, confined livestock feeding operations, and the overuse of fertilizer and pesticides for feed all threaten human health in the form of food borne illnesses, such as e-coli. The excessive use of antibiotics in livestock has led to antibiotic-resistant strains of bacteria that make treating illnesses more difficult in humans. These operations contaminate inland waters and contribute to large anoxic dead zones (areas in the ocean where oxygen is so low that animal life suffocates and dies) in the nation’s costal waters.⁶ In other words, these large-scale livestock facilities pollute the air, water and soil, thereby causing ecological damage and contributing to human disease. According to Crista Martin, the director of HUDS marketing and communications, HUDS purchases meat from industrial sources because only these agri-giants can service Harvard’s demands. Martin said that it’s easy to criticize the university dining services because no one considers the sheer quantity of food necessary to feed an entire campus. Behind the scenes, painstaking planning goes into each entrée, side dish, and the other one hundred items of food that students can choose from in the dining hall (this includes all the items in the sandwich line and salad bar, cereals, yogurts, breads, etc). Serving roasted chicken with carrots and dill for dinner is no trivial matter. 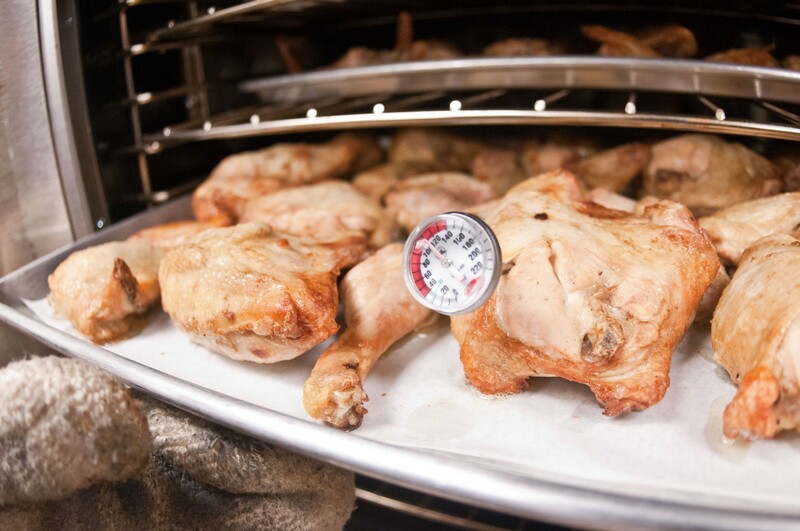 For that single entrée, 1000 pounds of chicken and 700 pounds of carrots are needed. HUDS doesn’t have the luxury of going to the local Cambridge Whole Foods and choosing to buy the organic, kosher, air-chilled chicken that was raised on strictly vegetarian feed (the website emphasizes that these chickens were “raised with plenty of room to flap their wings, run around, scratch, peck and forage!”)⁸. The only time HUDS purchases local and natural chicken is during the New England Harvest meal, which occurs once or twice a semester, when they buy Murray’s Family Farm Chicken. “But if we bought their chicken all the time, we’d drive them out of business because they can’t keep up with our volume,” Martin said. It turns out that there’s no one farm in New England that produces enough meat for HUDS’ demand (let alone one that raises meat in a sustainable way). 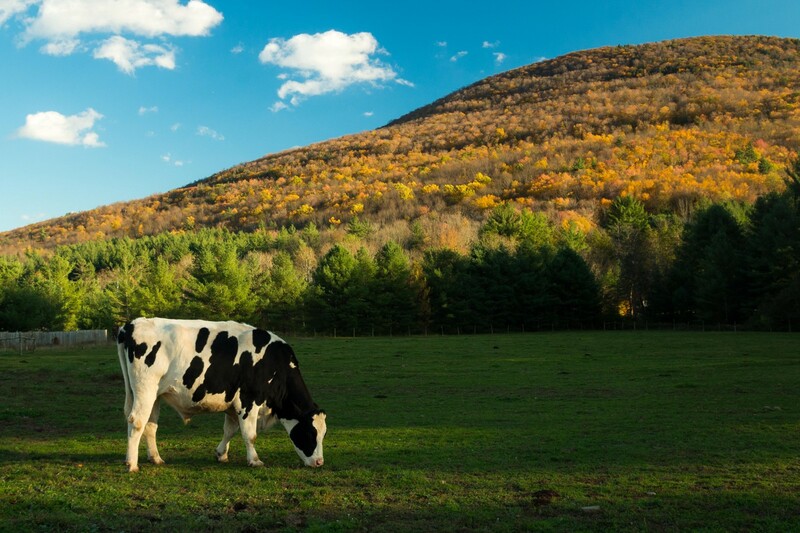 With almost 15 million inhabitants in New England, only 5 percent of the land is used for producing food. A part of the global system, New England receives 90 percent of the food consumed from outside of the region. Harvard is just another institution contributing to this overall statistic. The difference is that HUDS is able to source some of their vegetables and fruits from local New England farms, according to Margiana Petersen-Rockney, the director of the Harvard Food Literacy Program. Harvard uses the food distributor, Costa, to conglomerate produce from different farms and deliver them to campus. However, this type of local sourcing is not possible with meat, since a distribution infrastructure doesn’t exist for local and sustainable animal products. Even though there may be enough small and medium farms raising sustainable meat across New England that, when pooled together, could serve Harvard, there’s no way for all that meat to reach Harvard’s campus in a timely and cost-effective way. Still, the fact remains that Harvard is Harvard. It’s not me, you, or the hipster in Brooklyn debating whether or not to participate in the pricey CSA (Community Supported Agriculture) program.⁹ The millions of dollars that Harvard spends on food can actually impact the local market. Martin’s explanation of HUDS’ purchasing decisions is untenable, according to Alex Lu, Associate Professor of Environmental Exposure Biology at Harvard. Even if there’s not enough local and sustainable meat to supply the quantities that HUDS needs, the university can shift its purchasing habits and create an incentive for more farmers to raise livestock sustainably. According to Lu, if there is demand in the market, then farmers will raise more livestock to meet the demand. Think back to introductory economics: supply and demand curves intersect at the equilibrium. Institutions like Harvard have the purchasing power to put more of New England’s land into agricultural production, changing that equilibrium point. But if there’s no demand for local and sustainable livestock, then farmers and producers will be hesitant to start because they will lose money in their initial investment. As Lu sees it, if Harvard stopped buying meat from industrial sources, it would be a “win-win” situation; it would bring healthier food to Harvard and protect the environment, while also supporting local farmers to ensure they are making enough money. Petersen-Rockney agrees that Harvard has the potential to encourage small-scale farming, as some of the greatest challenges that farmers face are marketing and distribution. Large institutions, such as Harvard, alleviate these obstacles by being guaranteed buyers for the farmers. So what’s the real reason HUDS doesn’t go all local and sustainable? Well, it turns out that while Harvard University has an endowment of over $30 billion, the university dining services gets none of that. Not even a penny. “I was very surprised coming here that there isn’t more support from the rest of the university because the people who work here at HUDS really, really want to do the right thing,” Petersen-Rockney said. Before joining the Food Literacy Project at Harvard, Petersen-Rockney worked at a number of small non-profits; even in comparison to the budgets she has worked with in the past, she was very surprised to discover how small HUDS’ financial margin is. So even if New England could raise enough livestock to service the university’s demands, HUDS doesn’t have the budget. Meat is already expensive, and sustainable meat is even more expensive. The way that HUDS’ budget works is simple. All of the money HUDS can use for its food and operations comes from the meal plan that students pay as part of their tuition. Labor costs comprise well over half of the HUDS operating costs. The Harvard campus has 12 residential houses, each with their own dining hall. Though this system creates a special community between the students in each house, from a financial standpoint, it’s inefficient to have 12 dining halls (13 if you include Annenberg, the freshman dining hall), each with their own staff and chefs. Harvard also ensures that their workers receive above minimum-wage salaries and benefits, which is just as (if not more) important than the quality of food served. The tradeoff is that there is not as much money to spend on sourcing the best produce and poultry available. To make the budget even tighter, the university makes a conscious decision to keep the cost of tuition relatively constant. Since the number of students on campus does not significantly increase year over year, the dining services revenue stays flat. This is a frustrating quandary. Buying meat from industrial sources supports a system of environmental degradation and defective ethical practices, but stimulating too much local farming can have grave consequences as well. How can HUDS make a conscientious and environmentally friendly decision when there is no consensus as to which system is better? Barton Seaver, a chef, author, and Director of the Harvard Sustainable Seafood and Health Initiative, makes the point that halving the amount of meat served would have a greater positive impact on the environment than switching 4000 pounds of meat from Tyson to natural, organic, and/or sustainable sources. Neither local, sustainable farming nor industrial farming is truly “sustainable,” if that word is defined as a system that can be maintained in perpetuity. Take raising cattle, for instance. Even in the case of local and sustainable farming, think about the land-use alterations, large amounts of water, release of methane from the cows, and vast quantities of feed required. The important point here is that meat is resource-intensive no matter where it comes from. Money is not the problem. Meat is the problem. Removing the problem solves the quandary: in every scenario, eating less meat will do more than transferring the source of our consumption. The staff at HUDS, according to Martin and David Davidson, has internalized the notion that industrial farming makes sketchy ethical decisions and that raising livestock (no matter how you do it) is harmful to the environment. So why doesn’t HUDS just sharply reduce the amount of meat it serves? Because like the industrial corporations that rely on consumer demand, HUDS exists to please its customer. HUDS receives its budget from its customers, so students dictate their choices. Feedback and opinion from students — collected in the form of surveys, meetings with student representatives, and the online feedback form — directly factor into their purchasing decisions. Most importantly, HUDS tracks student preference by consumption. At the end of each dining session, employees log at what time food runs out, and how much is left over at the end of the mealtime. When asked what would happen if HUDS acted more as a benevolent dictator that completely removed meat options from the grille menu once a week, with a sign by the gridiron explaining the benefits of eating less meat for health and environmental reasons, Davidson laughed. “There would be a revolt,” he said. An intransigent population, a large portion of students have the mindset of “don’t tell me what to eat”, according to Davidson. To get around this psychology, HUDS has become more surreptitious about their actions. Starting last year, HUDS has reduced the amount of ground beef in ten dishes by 30 percent through the addition of mushrooms. This has not been met with any pushback from students, as this alteration does not change the flavor of the meat dishes. Student behavior and feedback show that while a sliver of the student population thinks deeply about the role that their dining hall food plays in the food system, the majority of students simply do not care. The fall 2014 dining survey responses revealed that from over 1,000 students surveyed, only 12 percent of students marked sustainably as “extremely important” to them, a decline from 14 percent in the fall of 2008. Only 19 percent of students said sustainably was “very important” in fall 2014, a decline from 31 percent in 2008. The rest of the students recorded sustainability as anywhere from not important at all to somewhat important. Sustainability is an honorable pursuit, but the mission of university dining services is to satisfy all 6,600 students. “We’re not the food police,” said Martin. The menu follows what students ask for. Theoretically, if students asked for it, HUDS could purchase 100 percent sustainable food. But with the current budget, the trade-off would be less variety of food, based on availability and cost. Every decision is give-and-take. “If they had loved less meat Monday, we would have gladly added less meat Tuesday, Wednesday, Thursday, Friday, and we could have saved money on meat to fund other programs [like brain break],” said Martin. The food served in Harvard University’s dining halls embodies the collective desires and decisions of its consumers. There is no nebulous despot who unilaterally decides what is served, and no one institution or person to blame. The world of Harvard and HUDS is a minuscule square in a mosaic, and the global food system is the image you see when you step back. “Our industrial, large scale, integrated food system is part of our creation,” said Gary Adamkiewicz, assistant professor at the Harvard Department of Environmental Health. Adamkiewicz points out that it’s a luxury to be able to eat unlimited amount of chicken breasts, hot dogs and burgers for an affordable price. The mass production and consumption of meat would not be possible without the monstrosity that has been created to service the demanded supply. There are certain efficiencies in the system that we’ve created, though there is much more to be desired. But again, there’s no dictator that presides over the global food system; indicting the system is impossible without also indicting ourselves, the consumers. Despite the polarizing portrayals in what is an amalgamation of documentaries, nonprofit organizations, and news articles, local, natural, sustainable, or whatever you want to call it, livestock farming is not the panacea. The whole situation is more like a whack-a-mole. Change one part of the system, and out pops another problem that wasn’t there before. In any event, it’s now 6:15 pm on a Thursday. Inside the servery, an assembly line of plates carries lumps of stories and life cycles. Today the dinner entrée dishes include “tomato salsa chicken” and “beef and mushroom stroganoff.” Observe Specimen B at the back of the dining hall. Bags under eyes: check. Hoodie: check. Unfinished problem set: check. He grabs one of the two burgers on his plate and bites into it. The yolk of the over-easy egg inside the bun bursts, sending a slow stream of yellow juice down the side of his mouth. His eyes close for a second, as if meditating on the explosion of taste, and the corners of his mouth turn upwards. Adler, Jerry and Andrew Lawler. “How the Chicken Conquered the World.” Smithsonian Magazine. This is an estimation calculated from the official data of all proteins purchased by HUDS that I received from the managing director. This information is from an interview conducted with Crista Martin, the Director for Marketing and Communications at Harvard University Dining Services. She would not disclose the names of the other brands, only that they were of the “conventional”/”traditional” meat sources. Throughout the piece, I use a variety of words that mean more or less the same thing: industrial food sources, large-scale livestock production, agri-business, agri-giants, etc. They refer to modern forms of intensive farming that produces meat at the highest output for the lowest cost by using machinery, biotechnology, antibiotics, pesticides, and vertical integration. In the last few decades, food production has consolidated and concentrated power into fewer and fewer corporations. Scrutiny of these concentrated operations has found that there is insufficient regard to the environment, animal wellbeing, soil and water quality, and food safety. A few large corporations — such as Tyson Foods, Pilgrim’s Pride, and Perdue Farms — dominate the broiler industry. But, the ones who actually raise the chickens are individual farmers that operate under contracts with these large processing companies. A 2001 study by the National Contract Poultry Growers Association and the U.S. Department of Agriculture found that 71 percent of growers whose only source of income was chicken farming were living below the poverty line. Organic: organic farming uses renewable resources such as crop rotation, green manure, compost, biological pest control, and the conservation of soil and water. Organic foods are produced without antibiotics, hormones, synthetic fertilizers, and pesticides. Natural: There is no formal definition of this, but it basically means the food uses straightforward ingredients. The USDA defines all-natural as foods that are minimally processed and contain no artificial/synthetic ingredients or chemical preservatives. Sustainable: There is no formal or legal of this term either. Some people consider sustainability a philosophy of food production that can be continued forever, without causing damage to the environment. Other define it in more concrete terms; for instance, here is the definition from Sustainable Table, a nonprofit organization: “Sustainable agriculture is a way of raising food that is healthy for consumers and animals, does not harm the environment, is human for workers, respects animals, provides a fair wage to the farmer, and supports and enhances rural communities. As you may or may not know, CSA stands for community support agriculture. CSA subscribers pay at the beginning of the growing season to get a share of the anticipated harvest. Once harvesting starts, they get weekly shares of produce. It’s an alternative, locally based model of agriculture and food distribution. I recognize the parallel here to the divestment movement at Harvard: universities turning away from corporations with unethical practices, sending a signal to the market and the public. The divestment campaign at Harvard has gained considerable momentum from students, alumni, and faculty, calling upon Harvard to divest its investments from fossil fuel companies. Despite their relentless campaigning, the University has maintained a hard stance against divestment. No movement close to the size of the divestment campaign has formed at Harvard in the sphere of food and environmental sustainability. However, I did speak with Maxwell Zacher, a senior at Harvard College, who is the leader of the student group Real Food Harvard. This student organization is very small, just a handful of students, with the mission of “promoting an increase in sustainable, local, fair, and humane food sourcing at Harvard.” Zacher and the group are currently working on the Real Food Calculator for Harvard University Dining Services. The Real Food Calculator has been used at other universities across the U.S., and it aims to track institutional purchasing over time to promote more “real food” purchases. I talked to Martin about this student effort, and she said she is skeptical of the effort, since HUDS already does their best to buy “real” food, given the budget constraints that HUDS has. Reporter & anchor at Bloomberg News. @Harvard grad. Previously @thecrimson and @HarvardPolitics.